We are publishing the new Access to Medicine Index on a new website. Our goal was to make it easier for you to find what you are looking for and to compare and share how the companies we evaluate are performing. Explore the new site, and let us know your feedback. Each detail from the 20 company report cards are online, and there is a new comparison hub where you can choose which topic from the report cards and which companies to compare. All of the figures and all of the analyses in the seven Technical Areas can be compared, for up to three companies. Look for the icon in the top corner of the graphs. There is also a new searchable section for browsing the 45 best and innovative practices identified in 2018. All 45 practices can now be filtered: by region, disease, company, topic (technical area), disease and type (best/innovative). It is also much easier to share the practices, and to connect with us to find out more. A nurse uses mobile technology during a consultation with a young mother. The technology is supported by a capacity building initiative from Novartis. Copyright: Novartis Foundation. 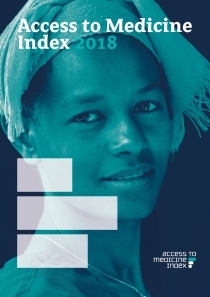 The 2018 Access to Medicine Index analyses the actions of 20 of the world's largest pharmaceutical companies across 69 metrics on improving access to medicine in 106 low- and middle-income countries and for 77 diseases, conditions and pathogens. With so much data to crunch, we have used many different charts, figures and graphics to ensure the most important findings are clear as well as interesting. Find leading graphics on key topics here. We're very interested in hearing what you think about the new website and its features. If you have a comment or idea, then please let us know.